Read the full interview with Pulsara’s CEO right here. [Bozeman, MT] — Feb. 17, 2017 — Healthcare Informatics has selected Pulsara to receive this year’s Innovation in Interoperability Award, which recognizes outstanding healthcare IT innovation that enhances clinician workflow, exchanges data, and/or reduces costs. A panel of Healthcare Informatics expert editorial board members selected Pulsara for its innovative, industry-leading platform — the only solution of its kind that manages the entire care process from EMS through to definitive care. 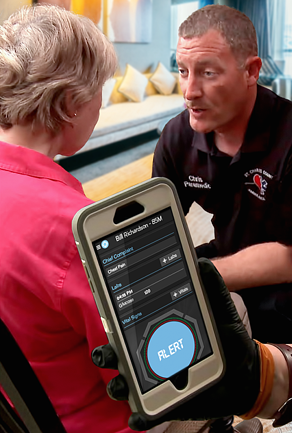 Pulsara performs like an app on users’ smart phones or tablets, allowing care teams to securely coordinate and accelerate life-saving care in emergency situations. Dr. Woodson will accept the award at the Innovator Awards Reception on February 21st at the annual HIMSS Health IT Conference in Orlando. Pulsara, which is used by hospital systems in 13 states and Australia, has been associated with a 10-46% reduction in treatment times for STEMI and stroke patients. With Pulsara, EMS agencies and hospitals are able to reduce risks during transitions of care, improve turnaround times for EMS, improve capture of registration and billing information, eliminate costs for ECG transmission, and reduce costly false activations. Hospitals have demonstrated a yearly 10X ROI using the platform. Read the full interview with Pulsara’s founder and CEO, Dr. James Woodson right here. Get instant blog updates from the Pulsara team sent directly to your inbox! Bringing together our innovative PULSARA PLATFORM with our Internet of Lifesaving People™ advisory services to promote streamlined workflows and positive change management to enable Internet of Lifesaving People™ real-time communication and information sharing for healthcare teams. The Pulsara applications are intended to facilitate communication for and accelerate preparation of acute care coordination. The applications are not intended to be relied upon for making diagnostic or treatment decisions or used in connection with monitoring a patient.